Growing up, travel was an essential part of our family. My mom is a woman who hates the cold, yet lives in Minnesota, so trips to warm weather were vital for every one's happiness. Whether a road trip across the country, or flying south of the border, we had a lot of adventures. 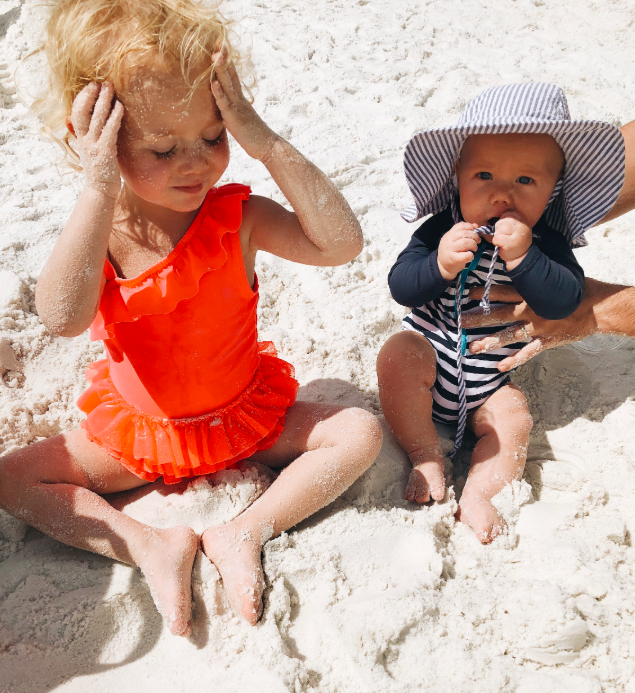 I never really thought twice about continuing to travel with my little ones! 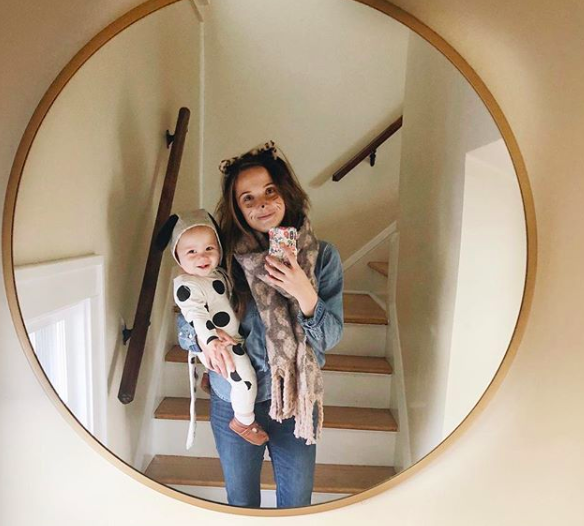 I feel like seeing new places, and getting out of our routine once in awhile is so important- and this is coming from a lady who reallllly loves her routine. However, I realize how daunting it could seem - unpredictable schedules, what to pack, and cranky, tired kids don't sound fun at all. So I thought I'd share what works for us- I am by no means a travel expert, but Ophelia now has eight flights under her belt, and Ralphie has four, so I've learned a few things! 1. If possible, try to book your flight during nap or night time. Our flight to Mexico left at noon, which was perfect. I like the Google Matrix for finding flights, because you can search when the best prices and times are within a month. 2. Babywear through security- often they will pull you out of the line to go through the metal detector! I also wear Ralph in his carrier on the plane to get him to sleep. My method- after take off, I have him in the carrier, facing me. Hood up. Muslin blanket over the top. Either go in the bathroom and bounce for a bit, or walk the aisle, and he's usually out in two minutes. 3. This is our travel stroller- it folds with one hand, and fits the security scanner belt, and in a taxi. 4. Screen time rules don't apply on a plane- Ophelia watched the full movie Frozen, both on our way there and back. 5. Normal airplane stuff will seem so cool to them- milk it! Take advantage! Ophelia ordered an orange juice from the beverage cart and was extremely pleased with the experience. We don't let her drink juice at home, so this was major. We talked about that orange juice for about 20 minutes. 6. Sticker books, new snacks, and these water books (Ophelia is obsessed!) will get you the rest of the way. 7. Renting a house/apartment (via VRBO or AirBnB ) is seriously the best with kids. We do this on our annual summer trip to Florida, and have done this twice in Paris. If that's not possible, booking a suite or anything with multiple rooms is really nice. When your baby goes to bed at seven, or is napping, its nice to not have to tip toe and whisper. We just had one room in Mexico, but had a full outdoor veranda with chaise lounges and a table and chairs, which was wonderful. 8. Stick to their schedules, kinda. At home, Ralph usually does a shorter morning nap, we go do a morning outing, then come home for lunch and they both nap (or Ophelia does quiet time). 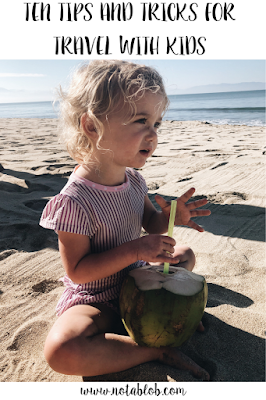 While on vacation, our outing is less open gym or story time, and more beach hang or day trip to Sayulita, we still have some loose structure to our day that they are used to. 9. Understand that vacations will look a little different. For me, there is a whole lot less sunbathing for hours with a good beach read. And it gets a little frustrating being stuck in the hotel for nap time, or at night (especially since my husband gets to go down to the pool...) but it actually makes for a relaxing break in the day. 10. WHITE NOISE- so essential. We bring our sound machine, but I also used this app on the plane and for stroller naps on the go. Every time I travel I am reminded of how small my day to day life truly is. Opening the window of how much bigger the world out there is an essential lesson that I want my kids to learn- to me, all the hassle is worth it. I recently read a quote about how you only get eighteen years living with your children, so filling them up with valuable memories and experiences is really important to me. Gotta make it count! Yes yes yes, it is wonderful to travel with kids. Wonderful ideas.